The NIF's tactics in fighting Nationality Law included deploying religious feminists in the Knesset. 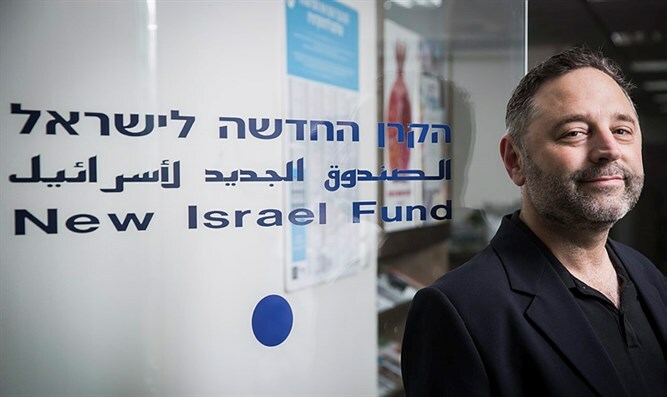 The Director of the New Israel Fund's Israei operations, Mickey Gitzin, recently exposed the NIF's tactics in battling the Nationality Law, which was recently passed by the Knesset. Speaking at an event last week that also included NIF President Daniel Sokatch, Gitzin pointed to feminist and LGBTQ organizations as the major forces deployed by the NIF against the bill, in Knesset debates. A recording of Gitzin's speech was obtained and made public by Channel 20. "The fact that we were able to integrate all the feminist groups to speak up together, including Orthodox feminist groups and others, is very meaningful. Organizing is very important. Same thing happened with the LGBTQ community. Our ability to bring different organizations from the LGBTQ community [to] speak in the Knesset was very meaningful. So organizing and getting different groups talking together, and tackling the system from different sides was very effective in this matter." Gitzin went on to name the "second tier" of operations – street protests. These were handled by an NIF-grantee Arab-Jewish group named Standing Together, the Reform Movement, and Peace Now. In addition – "high profile" persons including academicians and celebrities were persuaded to speak out against the proposed bill. Finally, said Gitzin, the NIF's "last resort" was to petition the Supreme Court. To this end, the anti-Zionist Arab group Adalah and the Association for Civil Rights in Israel were employed. The leftist opposition did not succeed in blocking the Nationality Law. However, it was significantly watered down from its original formulation – which would have allowed the establishment of Arab-only and Jewish-only communities. Gil Ronen is a father of two and founder of the Family Movement.